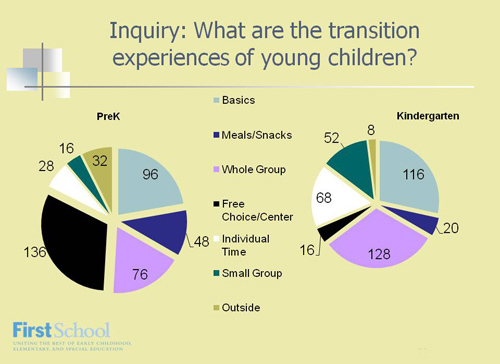 Use of data: What types of data and what kinds of supports to utilize data best improve transitions, home-school partnerships, curriculum and instruction, wellness and health, physical environment, and leadership? Achievement: What policies and practices produce equitable results for African-American, Latino, and low-income children? Classroom quality: How does classroom quality (climate, instruction, organization) in schools improve and how are those improvements sustained? Engagement: Under what circumstances do African American, Latino and low-income children in schools increase engagement with adults, peers, and learning opportunities? Collaborative structures: How often do teachers and other school personnel engage in collaborative structures (such as professional learning communities, joint planning time, vertical and horizontal teams, and school improvement committees)? To what extent do they include families, interdisciplinary staff, local service providers, and university faculty? To what extent do these structures engage in on-going inquiry?